Venusaur, Charizard, Blastoise, Pikachu and many other Pokemon have been discovered on planet Earth! Now's your chance to discover and capture the Pokemon all around you, so get your shoes on, step outside and explore the world. You'll join one of the three teams and battle for the prestige and ownership of Gyms with your Pokemon at your side. Pokemon are out there and you need to find them. As you walk around a neighbourhood, your smart phone will vibrate when there's a Pokemon nearby. Take aim and throw a Poke Ball. You'll have to stay alert, or it might get away! Certain Pokemon appear near their native environment, such as look for Water-type Pokemon by lakes and oceans. Visit PokeStops, found at interesting places like museums, art installations, historical markers and monuments, to stock up on Poke Balls and helpful items. As you level up, you'll be able to catch more-powerful Pokemon to complete your Pokedex. You can add to your collection by hatching Pokemon Eggs based on the distances you walk. Help your Pokemon evolve by catching many of the same kind. It's time to get moving, your real-life adventures await! Pokemon is short for Pocket Monster. In this game, you can catch as many Pokemon and train it. Then you can do battle with other players when you have reached level 5. Pokemon type has many varieties, depending on the location. Pokemon near water will have a different type to Pokemon that lived at land. - Download Pokemon Go APK. Notes: This Pokemon Go APK is 0.29.0 version. To get the latest version, you can find the related links at the bottom of that page. Notes: The links will open a new window to FileFactory website. If you do not have a FileFactory Premium Account, then you can click at the "Slow Download" button (usually at the left or at the bottom of that page). Wait a few seconds until there are "Start Download" button appear. Click at "Start Download" button to start the download process. - Install Pokemon Go APK. After the scan process is complete and there are no constraints, then your phone will automatically perform the install process. 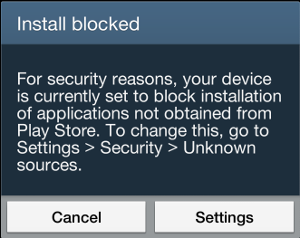 Due to the safety precautions, by default your cell phone will warn you that it did automatically blocking the installation process if the file installer does not come from Google Play Store. 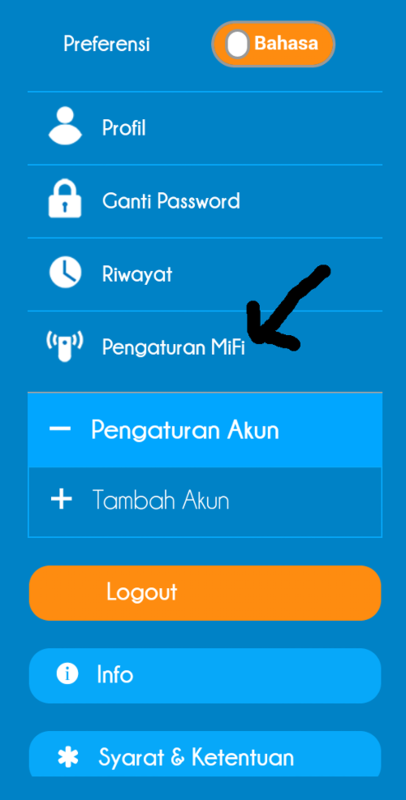 In order to continue the installation process, you must change the configuration of your cell phone security through Settings option, then click at Security option. 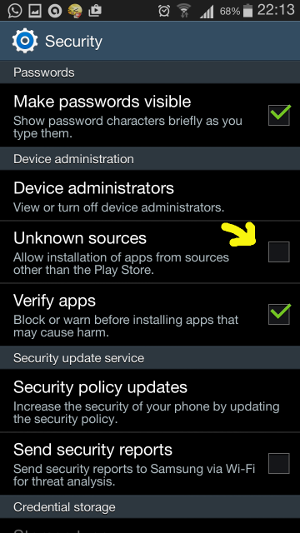 Subsequently check the Unknown Sources option. 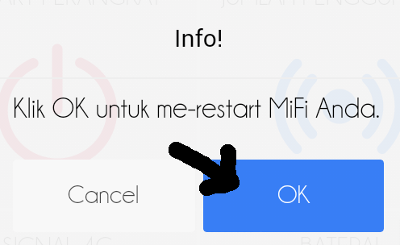 For safety, make sure you check the "Allow this installation only" option at the warning windows that appears at your cell phone screen. This is to ensure that the installation of applications outside of Google Play Store only for the installation process at this time only. Then you will see what functions or features that will be using by Pokemon Go application. If you agree, click at the Install button. 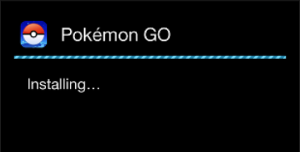 Then the Pokemon Go application installation process will begins. Wait until there is a notification that the installation process is completed. After the installation process is complete, click at the Open button to start the Pokemon Go application. 005. Where you can find Pokemon? Pokemon can appear in any place. On your cell phone screen on the bottom right, there is a radar that informs the type of Pokemon that are around you, whether you have captured it or not. Try to walk around to find it. 006. What is the purpose of the Pokemon images contained on Radar? If you look more carefully at the picture of the Pokemon in Radar, there are footprints. The footprints indicate how far / near the Pokemon from you. The fewer Pokemon's footprints, means that Pokemon are getting closer to your position. 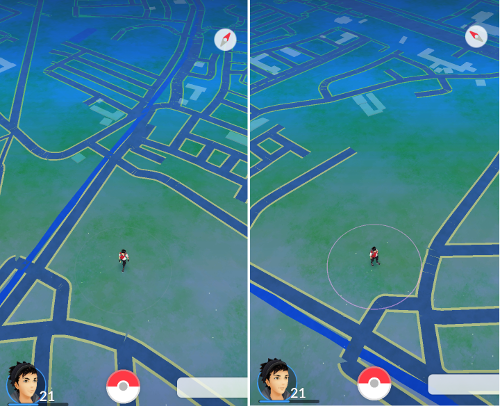 If the Pokemon's footprints does not appear, it means that the Pokemon is very near to your position. Click on the picture of that Pokemon and wait a few moments at where you stand until that Pokemon appear and be ready to capture it. 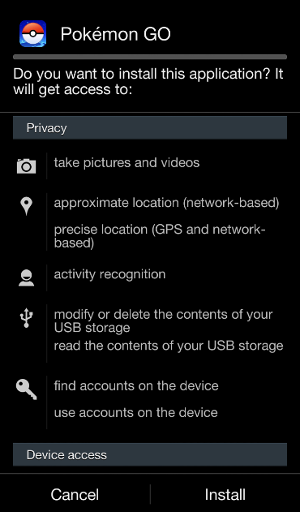 (*) 2 => Click on the AR button to disable / enable Augmented Reality function. In order to more easily capture Pokemon, you can deactivate this function AR. (*) 3 => Information about Pokemon that you are currently facing, along with that Pokemon's CP (Combat Power) values. (*) 4 => Poke Ball. Handy for catching Pokemon. Press this Pokeball and navigate to the Pokemon you are facing. To catch a Pokemon, throw your Poke Ball towards the Pokemon using your fingers. If you do it right, then you can see a Poke Ball will fly in the direction of the Pokemon and then the Pokemon will be sucked into the Poke Ball. You can also use a more powerful Poke Ball to catch a Pokemon, such as Great Balls and Ultra Balls. But the characteristics of each type of Pokeball have differences, so your throwing technique will also be different. 008. Although you've managed to capture a Pokemon in a Poke Ball, with its tremendous strength, the Pokemon may succeed to get out of the Poke Ball. And you have to swing a Poke Ball again to catch that Pokemon. When you encounter Pokemon in the wild, you can use your camera to photograph them. A device that incubates an Egg as you walk until it is ready to hatch. Requirements to be able to hatch is you have to walk several kilometers until the eggs are ready to hatch. At the time of hatching, a (pop-up) notification will appear to you about the type of Pokemon that have been born. There are 2 types of Egg Incubator, which are Egg Incubator Ultimate and Egg Incubator Ordinary. For Egg Incubator Ultimate there will be no limitation in the process of hatching Pokemon eggs, while the Egg Incubator Ordinary can only do a maximum of three times process of hatching Pokemon eggs before the Egg Incubator Ordinary getting damaged. You will acquire Egg Incubator Ultimate automatically at the beginning of the game and it is not available in Shop. While the Egg Incubator Ordinary are available in the Shop, or you can get it in the PokeStop. Has the same functionality as Poke Ball but also has a higher percentage to capture Pokemon compared with a Poke Ball. A spray-type medicine for treating wounds. It restores the HP of one Pokemon by 200 points. This item will lure wild Pokemon to your location for 30 minutes. A Lucky Egg that's filled with happiness! Earns double XP for 30 minutes. A module that attracts Pokemon to a PokeStop for 30 minutes. The effect benefits other people nearby. A spray-type medicine for treating wounds. It restores the HP of one Pokemon by 20 points. A spray-type medicine for treating wounds. It restores the HP of one Pokemon by 50 points. Feed this to a Pokemon, and it will be easier to catch on your next throw. A medicine that can revive fainted Pokemon. It also restores half of a fainted Pokemon's maximum HP. An ultra-high performance Poke Ball that provides a higher catch rate than a Great Ball. 010. If you have more than 1 Egg Incubator, then you can make the process of incubation for more than 1 Pokemon Egg simultaneously, depending on the amount of Egg Incubator you have. - The gym is a place where your Pokemon against another player's Pokemon. - Gym locations on the map marked by a high tower which is scattered in various directions. - You can enter the gym when you have reached level 5. (*) Yellow is Team Instinct. Lead by Spark. In order to strengthen the existing of Yellow Team Pokemon, the exercise will focus on the Instinct of each of these Pokemon. Spark also assured by focusing on the Instinct, this will make the process of hatching (Hatching) of Pokemon will be more effective. 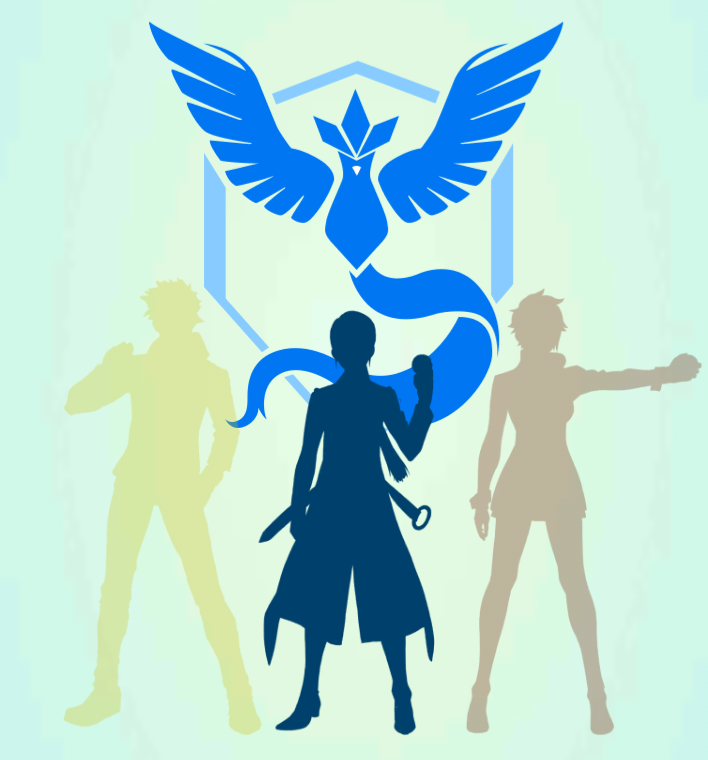 (*) Blue is Team Mystic. Lead by Blanche. In order to strengthen the existing of Blue Team Pokemon, the exercise will focus on the Wisdom of each of these Pokemon. Blanche also assured by focusing on the Wisdom, it will make the process of development (Evolving) from Pokemon will be more effective. 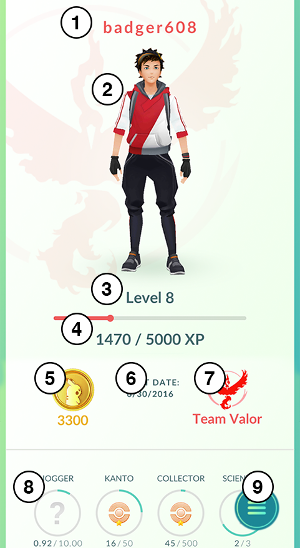 (*) Red is Team Valor. Lead by Candela. In order to strengthen the existing of Red Team Pokemon, training provided will be focused on Natural Strength of each of these Pokemon. Candela also assured by focusing on the Natural Strength, it will make the power of Pokemon in battle will be more effective. - If a gym is controlled by the opposing team, you can attack it. 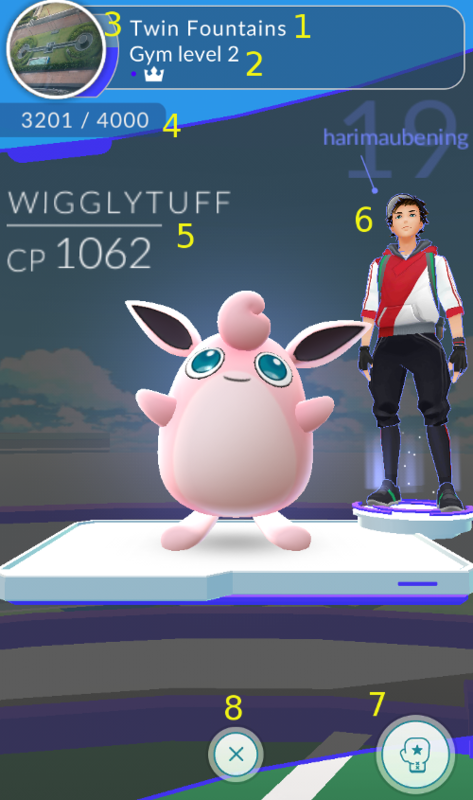 If you can beat every other team in the gym and the Gym's Prestige drop to 0, then the gym will be Vacant (No Owner) so you should immediately put your Pokemon as a guard to claim Gym as one of the your team Gym. But when you lose in the fight against the opposing team, your Pokemon will be pass out (Hit Point drop to 0). To make your Pokemon conscious, you can use Revive items. If you lose against the opposing team, but you can beat at least 1 opponent Pokemon, then you have succeeded in lowering the prestige value of the Gym. Meanwhile, if you absolutely can not beat at least 1 opponent Pokemon, then the prestige of the gym is not going down. When you attack, then you will be fighting the weakest first. Furthermore, if you win, then you will fight against a stronger enemy. And so on until you fight the most powerful enemy in the Gym. You can also place your Pokemon as a guard in more than 1 Gym. If after you take your 'salary', you've managed to put your Pokemon as a guard at another gym, you still have to wait until the period of your payday active again. (*) Check that the distance between each gym is very close, so moving from 1 Gym to another Gym is no more than 2 or 3 minutes. This is assuming that the opposing team can win the Gym with an estimated time of 5 minutes. (*) See the power (CP) of Opponent Guard Pokemon in each gym. Are your Pokemon warrior strong enough to conquer all opponent Pokemon troops? (*) Check your Revive Potion and Health Potion stocks. Due after you finish fighting in a gym, you need to treat your Pokemon troops before attacking another gym. (*) If the results of the above measurement done and you feel ready, then attack the first Gym. (*) After succeed conquering the first gym, treat your Pokemon troops if needed. After that, attack and conquer the second Gym. (*) If there are any other gym with a distance that is still affordable and you feel that the Gym that you have conquered has strong enough against Opponent Team, then treat your Pokemon troops if needed. After that attack and conquer the third Gym. (*) If there is no other gym with a range of affordable or you feel that the Gym that you have conquer threatened by Opponent attack, it's time for you to take your 'salary' in the Shop. - If you have placed your Pokemon as a guard and then the opponent manage to beat your Pokemon, your Pokemon Hit Point will drop to 1. But since version 0.35.0, your Pokemon Hit Point will drop to 0. And you need Revive items to make your Pokemon conscious. - If a gym is controlled by your team and there is no available guard slot, you can still do the exercises by attacking your Pokemon team who guard the Gym. If you win, then the prestige of the gym is going up. At every level of a certain prestige, the level of the gym could rise and along with rising levels Gym, then the guard slots will also increase, so there's an opportunity that you can put your Pokemon in the guard slot that available. If you lose, then your Pokemon's Hit Point will drop to 1. But since version 0.35.0, your Pokemon Hit Point will drop to 0. And you need Revive items to make your Pokemon conscious. (*) 1 => Gym location. (*) 2 => Level of the Gym. Based on the picture, the Gym has reach level 2. The Gym Level is also determines the number of a guard slot. In the picture, because the gym has reached level 2, the guard slot is 2. If the gym has reach level 1, the Guard Slot Guard is 1. In the picture, the Guard Slot is displayed with crown image and the dots image that appear below the level of the Gym information. The red, blue or yellow dots (depending on the Gym Team Owner) indicates which Guard Sloot that you're looking at. Based on the image, you're looking at Guard Slot number 1 (far left). You can slide the screen of your cell phone left or right, to see the other guard slot. 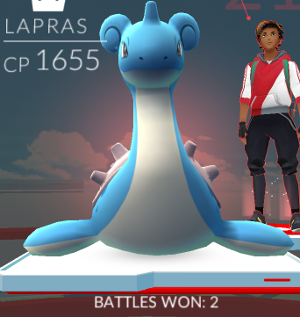 The guard slot that marked by the Crown indicates that the Guard Pokemon who occupy these slots are the strongest in the Gym. (*) 3 => Real Picture of the Location of the Gym. (*) 4 => The prestige of the Gym. 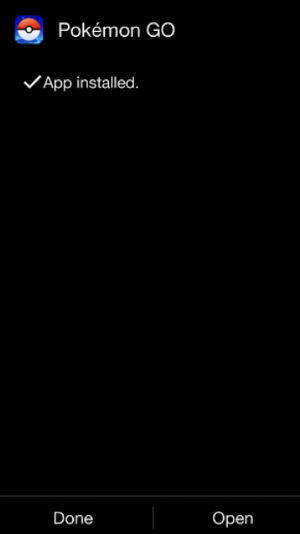 The left hand value is the current value of the Gym Prestige Gym, while the value on the right is the threshold of the current levels Gym prestige. If the current prestige value reaches the threshold, then the gym will automatically level up. Conversely, when the Gym prestige value reaches 0, the occupant team will be displaced from its ownership of the Gym and the Gym will be in Vacuum status (No Owner). When this happens, immediately put your Pokemon in a Guard Pokemon slot to claim ownership of the Gym. (*) 6 => Information about Pokemon owners who occupy the guard slot. If you look closely at the picture, behind the name of the owner of the Pokemon, there is information on the level of the owner. Based on these images, the owner of the pokemon has reached level 19. (*) 8 => Button to close the Gym screen. (*) Then you are obliged to organize your Pokemon troops to be assigned to practice / attack the Gym. When practicing with your team, you only need to define one Pokemon to fight. Whereas if attacking another team, then you need to assign six Pokemon to fight. Click at the Pokemon picture if you want to replace it with your other Pokemon. (*) If you are satisfied with your Pokemon troop formations, then click the GO button to start the fight. To attack, tap the screen of your cell phone to make a Fast Attack. Every time you attack using the Quick Attack, the energy to do the Ultimate attack will increase. If the Ultimate Attack Energy (the blue bar) has been filled and blinking, then you can issue the Ultimate Attack by tapping the screen of your cell phone a bit longer until the Ultimate Attack occurred. Avoid the opponent's attack can be done with a sweep (swipe) the screen horizontally. With the right timing, enemy attacks can be avoided although its a little bit difficult. (*) 6 => Energy to do the Ultimate Attack. If the blue bar has been fully filled, the blue bar will get blinking. And that the time you can do the Ultimate Attack. If you win in training / fighting, then you will get experiance Point. In addition, if you practice, then the prestige value of Your team Gym will go up. 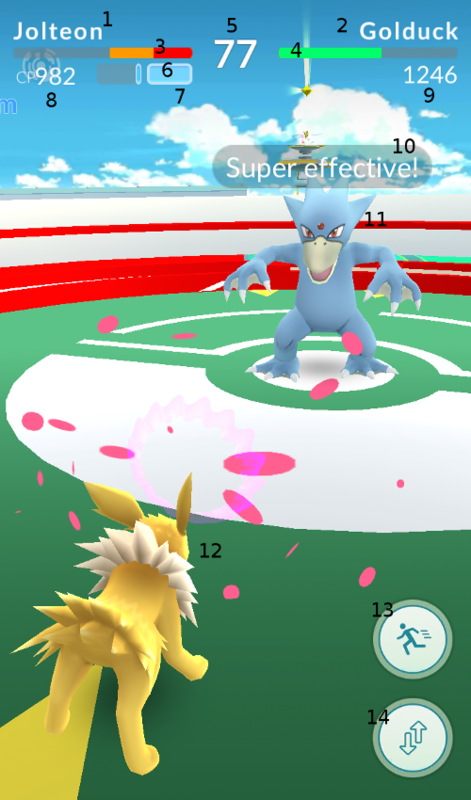 Whereas if you fight, the Prestige Values of Your opponent Team Gym will fall. 012. When you are dealing with Pokemon, sometimes you see ??? sign on the Pokemon's CP. This indicates that the Pokemon is too strong for your current level. Although it is very difficult, you can still catch the Pokemon. By raising your level, it will decrease the level of difficulty in capturing Pokemon (you will more easily catch the Pokemon). 013. Training your Pokemon is also depends on your level. If your level is not high enough, when you want to train your Pokemon there will appear a warning message that said "Trainer is too low to power up". The higher your level, then you can train your Pokemon to achieve higher CP. (*) 1 => Compass. 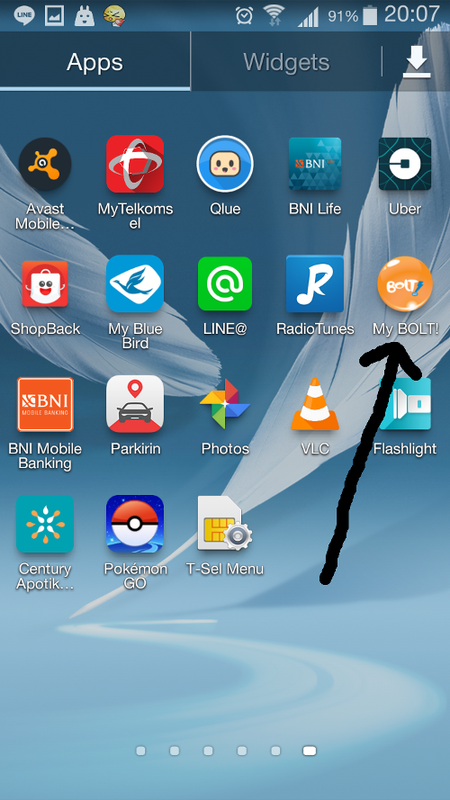 You can setting whether always heading north or automatically rotates depending on the direction of your cell phone. (*) 5 => Your Profile Picture. Click on the image of your profile to obtain information on progress and rewards that you've been accomplished. 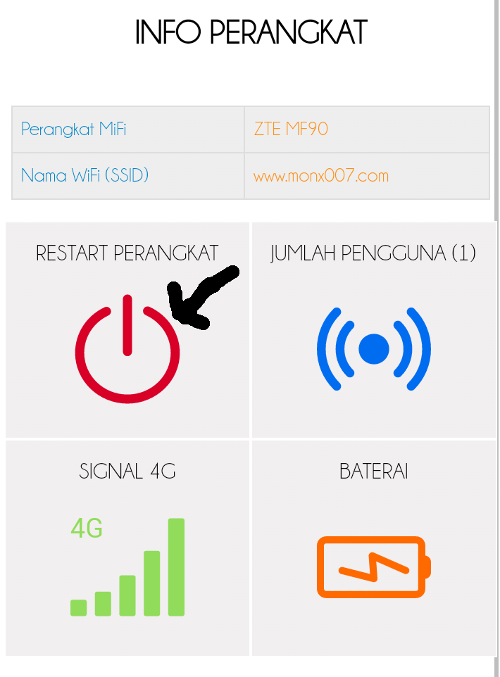 (*) 6 => Main Menu. Click here to access the Main Menu, including your game settings, your Item List, List of your Pokemon, your Pokedex and so on. (*) 2 => If you click this sign, you will set that Pokemon as one of your Favorite Pokemon. Your Favorite Pokemon can't transfer (sell) to Professor. (*) 7 => The total number of Stardust and Candy you've got. While the below value is the number of Stardust and Candy need to Train (Power Up) and Developing (Evolve) your Pokemon. In the example image, you need 600 Stardust and 1 Rattata Candy to train (Power Up) the Pokemon. And you need 50 Rattata Candy to develop (Evolve) the Pokemon. (*) 8 => Pokemon Attack Moves. In the example picture, Pokemon Rattata will use Tackle as its fast attack and use Hyper Fang as the Ultimate Attack. Ultimate Attack = requires a number of Energy as shown in the blue bar color. (+) Appraise. 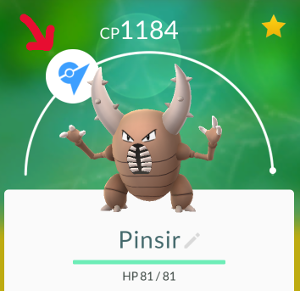 Clicking at this button will make your team leader (see Tips number 011 above to get more information about the Team Leader) analyse this Pokemon and give your more information about this Pokemon. See Tips number 023 to get more information about Appraise. (+) Transfer. Button to transfer the Pokemon to the Profesor. Click at this button to sell these Pokemon to Professor. You will receive the Candy from the Professor. In the example picture, if you sell Pokemon Rattata, then Professor will give Rattata Candy to you. Keep in mind that when you sell your Pokemon to the Professor, you can not take back the Pokemon that you've sold it. 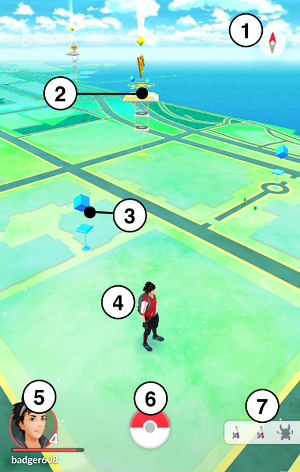 Turn the PokeStop by swiping the screen of your cell phone to the left or right in order to make the PokeStop drop some items that are in the PokeStop. Keep in mind also that the capacity of your backpack by default is only can hold 350 items. If the capacity of your backpack is full, then PokeStop will not release the items, and you'll get a warning message that said "Your bag is full". 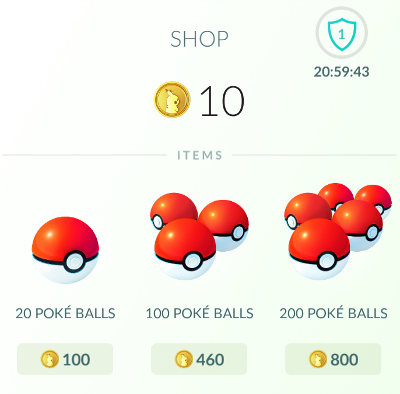 (*) 2 => If you didn't have any module in your inventory, then you will see a message "Collect More PokeStop Modules!". 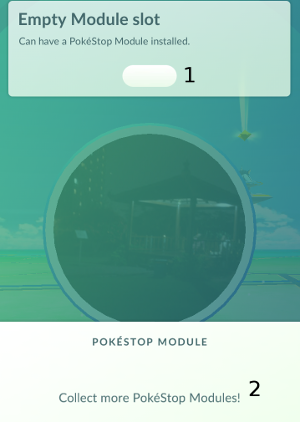 But if you have a module at your inventory, you will see the picture of the module at this section, and if you want to place that module, just click at the module image to place the module at the empty PokeStop slot. After the PokeStop drop some items, the PokeStop color will change to Pink. 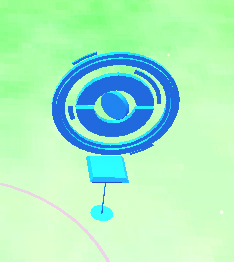 After a few minutes (around 5 minutes or so), the PokeStop will turn back to the blue color and you can get the items from that PokeStop again. 018. In the process of hatching, give priority to incubate the eggs that need the shortest travel distance. In this way, you can avoid your eggs storage become full. 019. The higher the level of your Trainer, then your chance to find more powerful and rare Pokemon will be higher. 021. If the Pokemon Go application has been officially present in your country, but you do not find Pokemon Go app on Google Play Store, it is probably because your phone does not support to play Pokemon Go application. 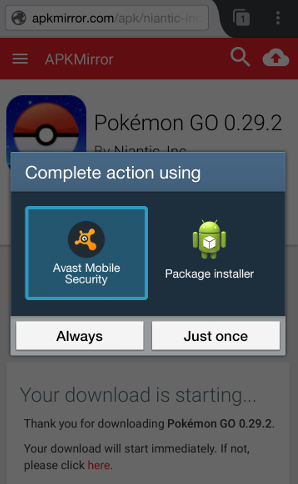 One of the solutions that you can try is to install the application using the Pokemon Go APK installation mechanism (as in step number 002 above). When the author makes this tips, the minimum requirement to play Pokemon Go is to use the Android OS version 4.4.4, while the author uses the Android OS version 4.4.2. Fortunately, the author still can play the Pokemon Go by installing the Pokemon Go APK. 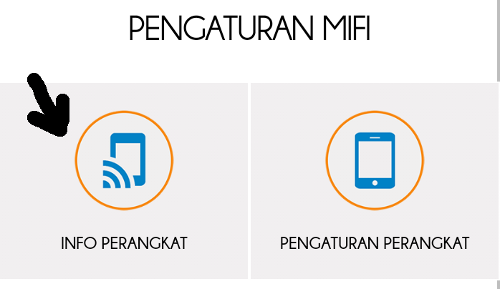 (3) In the "Pengaturan MiFi" screen, click on the button "INFO PERANGKAT"
(4) In the "INFO PERANGKAT" screen, click on the button "RESTART PERANGKAT"
Blanche will said, "Overall, your [Pokemon Name] is not likely to make much headway in battle"
Candela will said, "Overall, your [Pokemon Name] may not be great in battle, but I still like it!" Spark will said, "Overall, your [Pokemon Name] has room for improvement as far as battling goes"
Blanche will said, "Overall, your [Pokemon Name] is above average"
Candela will said, "Overall, your [Pokemon Name] is a decent Pokemon"
Spark will said, "Overall, your [Pokemon Name] is pretty decent!" Blanche will said, "Overall, your [Pokemon Name] has certainly caught my attention." Candela will said, "Overall, your [Pokemon Name] is a strong Pokemon. You should be proud!" Spark will said, "Overall, your [Pokemon Name] is really strong!" Blanche will said, "Overall, your [Pokemon Name] is a wonder! What a breathtaking Pokemon!" Candela will said, "Overall, your [Pokemon Name] simply amazes me. It can accomplish anything!" Spark will said, "Overall, your [Pokemon Name] looks like it can really battle with the best of them!" At this category, your team leader will inform you about your Pokemon's Best Attribute, either Hit Point, Attack or Defense. 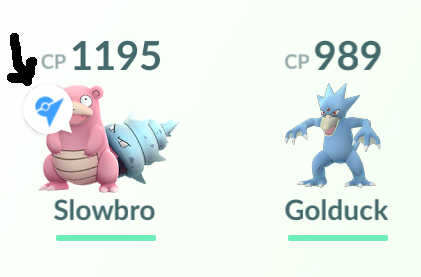 And if there are more than 1 that has the same Best Attribute, your team leader will also inform you the other Best Attribute that your Pokemon has. Blanche will said, "Its stats are not out of the norm, in my estimation." Candela will said, "Its stats don't point to greatness in battle." Spark will said, "Its stats are all right, but kinda basic, as far as I can see." Blanche will said, "Its stats are noticeably trending to the positive." Candela will said, "Its stats indicate that in battle, it'll get the job done"
Spark will said, "It's definitely got some good stats. Definitely!" Blanche will said, "I am certainly impressed by its stats, I must say." Candela will said, "It's got excellent stats! How exciting!" Spark will said, "Its stats are really strong! Impressive." Blanche will said, "Its stats exceed my calculations. It's incredible!" Candela will said, "I'm blown away by its stats. WOW!" Spark will said, "Its stats are the best I've ever seen! No doubt about it!" Blanche will said, "Your [Pokemon Name] is tinier than any we have on record. Astounding." Candela will said, "Your [Pokemon Name] is so tiny, I almost didn't notice it!" Spark will said, "Wh-whoa. That's the tiniest [Pokemon Name] I've ever seen!" Blanche will said, "Your [Pokemon Name] is below average in size"
Candela will said, "Aww, what a small [Pokemon Name]! It's rather cute, I'd say." Spark will said, "Your [Pokemon Name] is a little small for its kind, don't you think?" Blanche will said, "Your [Pokemon Name] is above average in size." Candela will said, "Your [Pokemon Name] is rather sizable, that's for sure!" Spark will said, "Your [Pokemon Name] is a BIG one!" Blanche will said, "The size of your [Pokemon Name] is... colossal. This is indeed exceptional. Fascinating!" Candela will said, "Your [Pokemon Name] is giganticâ€”the largest I've ever seen!" Spark will said, "Your [Pokemon Name] is just HUGE!" 001. You are too lazy to move? Try Logout and Login the Pokemon Go application, if you're lucky, there will Pokemon that appear that ready for you to catch. - When you play Pokemon Go application for the first time, you will be ordered by Professor Willow to catch your first Pokemon, that appear near you. There are 3 Pokemon, which are Bulbasaur, Charmander and Squirtle. - Don't choose one of them. Instead, just walk more further. The 3 Pokemon will follow you. Ignore them. When you keep walking, Pikachu will appear. So, in total, you will see 4 Pokemon that near you. - Catch the Pikachu using your Poke Ball. - To become Jolteon, you must change the name into Sparky. - To become Vaporeon, you must change the name into Rainer. - To become Flareon, you must change the name into Pyro. To ensure that the evolution goes according to your plan, after editing the nickname, close the Pokemon Go application. After that play the Pokemon Go applications again and make sure the nick name has changed the way you want. Then you can continue the Evolve Process. 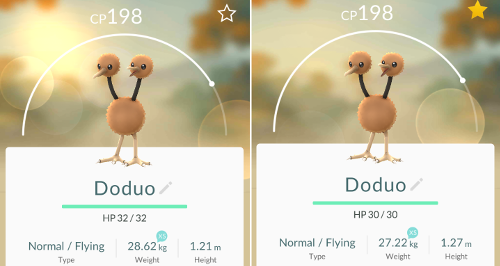 After successfully Evolve to your liking, you can change the name to the default, by removing the nickname. After the nickname is removed, then the Pokemon names will automatically return to its original name (default). 005. At PokeStops, after you sweep (swipe) the screen of your cell phone to the left or to the right and the items will appear on the PokeStops, you do not need to tapping each item in order to take the items. Instead, just close the PokeStops screen, then these items will go into your inventory. 006. 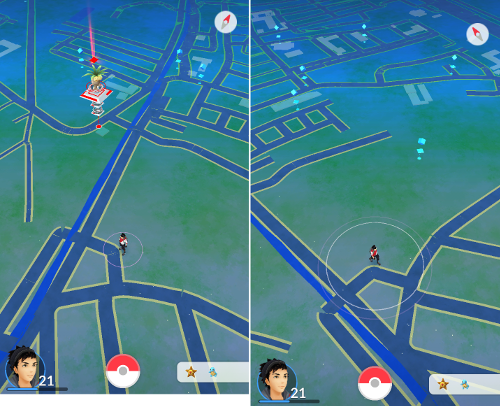 The indication that the wild Pokemon that you want to capture is trying to escape is when the distance between you and the wild pokemon goes further and further away. To minimize the percentage of the escape of the wild Pokemon, you can use the Razz Berry and using a more powerful Poke Ball. 007. 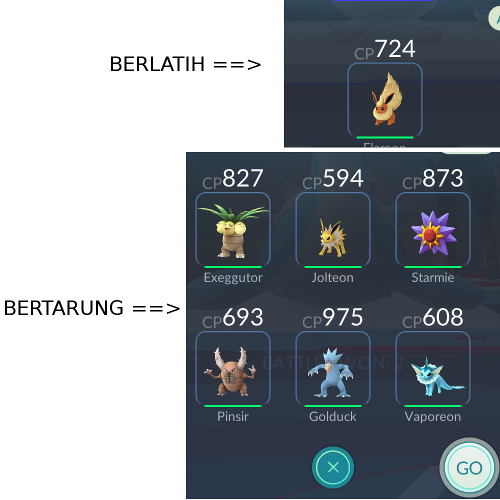 Since Appraise function launched, when you evolve your Pokemon, all of your Pokemon charateristic / stats didn't change, except of Pokemon's size. So when you want to evolve, I'm sure that You know what Pokemon that best to evolve (see at Tips and Tricks number 023).